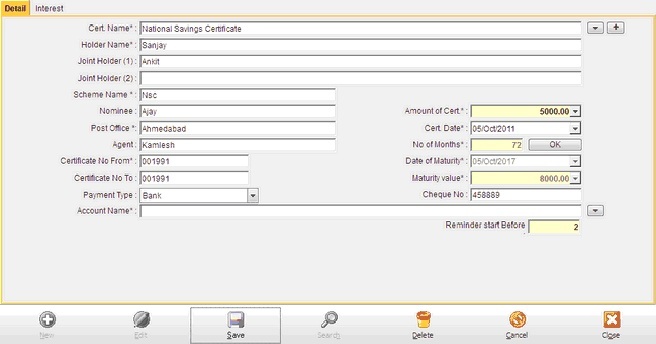 This options helps the user to store the details of the different types of Certificates/Bonds, etc.The details that can be entered are the holder’s name, the name of the joint holder if any, the name of the nominee, the amount of the Certificate/Bonds, the name of the post office, the date on which the Certificate/Bond was purchased, the name of the agent, the number of months, number of certificates, the date of maturity and the amount to be realized on the date of maturity. Holder Name Automatically select current member. Join holder (1) Maximum length is 40 characters. Join holder (2) Maximum length is 40 characters. Scheme Name Enter scheme name here and maximum length is 40 characters. Nominee Maximum length is 40 characters. Post Office Maximum length is 40 characters. Agent Maximum length is 40 characters. Certificate No From Maximum length is 20 characters. Certificate No To Maximum length is 20 characters. Amount of Cert. Enter amount of cert. Cert. date (Date) Enter Cert. date here. No of months Enter total moths of Cert. Date of maturity (Date) Enter maturity date of Cert. Maturity value Enter maturity value. Payment Type Select payment type of certificate/bonk. Ref/Cheque No If bank then cheque no or other then ref no. Account Name Select account name of payment. Reminder start before Enter reminder start before days. In this section software provide following certificates/shemes details. So, user manage his/her certificates/bonds very easily. 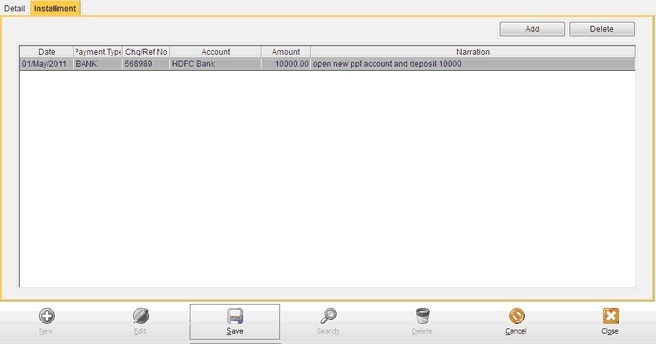 In this software provide interest details of Kishan Vikas Patra,NSC and in PPF account you can manga your installments of your account.